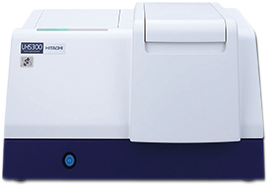 Double beam Pharmacopoeia-compliant UV Vis spectrophotometer featuring a Xe flash lamp with a 7 year lamp warranty. The U5300 double beam Pharmacopoeia-compliant UV Vis spectrophotometer can be run via an I-Pad app or via a Windows based PC. The control software is designed with emphasis on simple and intuitive operability, providing an easy-to-follow measurement flow, even for someone who is unfamiliar with a spectrophotometer.